Thailand along with any other place on the planet has its good and not so good sides. That’s just how life works. We have have to look at the overall balance. For me, there are more good sides to Thailand than problematic sides. That’s why I live here. It can be quite interesting to look at how one characteristic can be both good and not so good, depending on the context. The Thai people are generally quite patient. This can be very refreshing, especially if, like in my case, you came from the US where patience is not high on the agenda. In Thailand, people generally stand in line and wait patiently (well, not always). It is normally quite orderly, nobody is pushing or shoving or complaining that the line is too slow. If you would go to India, for example, you would experience the opposite. It is mayhem and pandemonium and it can drive you crazy if you are not used to it. People are pushing, poking their elbows into your ribs, trying to get ahead of you and squeezing all around you until you feel like a sardine in a can. Thailand is quite refreshing in this regard. In Thailand we have good and sensible traffic rules, not so different from the rules in western countries. The only problem is that many people just don’t follow those rules. It is quite common to see someone parking in the middle of the road, obstructing all the traffic. But the Thais don’t get all bent out of shape, they just wait until they can get by the offender without losing their temper. Another very frequent occurrence is that you get cut off in traffic by someone. 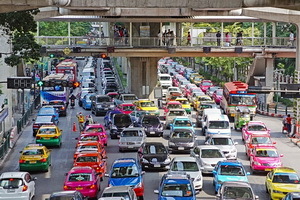 Instead of insisting on their right of way, the Thais patiently wait until they can keep on moving. Nobody honks the horn or gets mad at you. One reason is that they all know that sooner or later they will cut someone off too, and so it all balances out. In contrast, if that happens in the US, people give you the finger, roll down the window and holler at you, call you names, and lean on their horn. It can be quite scary! Thailand has lots of flooding problems during the rainy season. Every single year large areas of the country get flooded which causes major problems and disruptions. 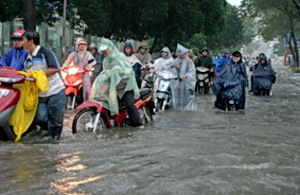 I remember one year when parts of Chiang Mai, the city that I live in, were severely flooded. I know people who had to take boats to reach their partially submerged homes, and many people had to wade through hip-high water to go anywhere. But I never saw anyone who was terribly upset, angry, complaining or even in a horrible mood. There was no social unrest, no looting, no crime, and no special police or army units were needed to control the population. People just did what they could to deal with the water and otherwise patiently waited until the water had drained away. This happened to be around the same time when the city of New Orleans in the US was flooded after a big hurricane hit the area. What happened there made international headlines. There was lots of looting, crime, murder, rage, unrest, blame and bitterness. Thousands of police and national guard units had to be called in to keep the situation somewhat under control which they were not very successful at. Same situation – totally different reactions. I was very glad that I was in Thailand during the floods and not in New Orleans. However, the Thai patience has another side to it which is not so good. There is a point where patience can turn into indifference, inaction, or lethargy. Let me give you some examples. 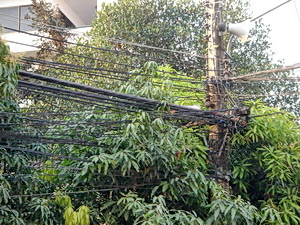 Normally the electricity works quite well in Thailand. But in my neighborhood there is a real problem. Almost every time when there is a strong rain or wind, a transformer near my place shortcircuits. I hear a big boom, and the electricity goes out. It takes around two hours for the electric company to come around and fix it. This can be a major inconvenience in a hot tropical country where you really depend on cooling fans and aircon.. This has been happening over and over for many years. Clearly the transformer has a problem, and clearly nobody is fixing it. Bottom line is that nobody is doing anything to straighten this big inconvenience out, although many people are affected. They just patiently wait for the company to do another temporary fixing job – until the darn thing goes ‘boom’ again and we are sitting in the dark, sweating bullets in the heat without a fan – again. That type of thing would not go on for long in less patient cultures like America. Sometimes I go on longer bus rides, and the driver sets the temperature to a freezing level. People put on jackets and shawls, huddle up together, clearly feeling cold and uncomfortable. You would think that there is a very easy solution – you just go to the driver and ask him to adjust the temperature. Does anyone ever do this? No! I am the only one who goes and talks to the driver, and people think that I am quite daring and outspoken. 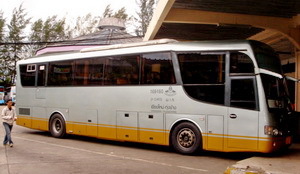 In Thailand you don’t challenge authority figures, and for this bus ride, the driver is the authority. Everyone patiently sits there freezing until they get to their destination. I really like the patience of the Thai people. It makes life so much less stressful. But I also have to put up with the dark side of the patience which is an indifference that often results in things not getting done. It’s the “Someone will do something about it at some time, but not me” syndrome. Well, you can’t win them all. I would still rather put up with the sometimes annoying indifference of the Thais than with the impatience, road rage, verbal aggression and other expressions that you frequently find in the western world. The Thai patience makes up for a lot of their indifference. There is a reason why tens of thousands of foreigners live in Thailand. It is not perfect by a long shot, but on balance it is a very nice and pleasant place to be. Just to be fair, there are lots of nice things in America as well, but this article is about Thailand. 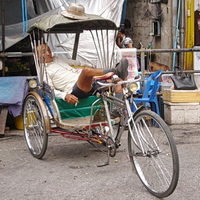 The author, Shama Kern, has been living in Chiang Mai, Thailand, with his Thai wife for over a decade. I agree Adrian that there are regional differences in the US. My purpose is not to be critical but to point out some differences in attitude between Thailand and other countries. Necessarily I have to generalize a bit. Even in Thailand there are regional differences when it comes to friendliness and patience. But my article would become too complicated if I would try to go into such detail. Thai people wait patiently in line? Dude, when was the last time you went to a 7-11? Taking cuts in line is the norm here. That would provoke a confrontation in the states. There was flooding in Iowa a couple of years ago and no civil unrest. Regional differences. People in Iowa seem to be able to handle things better than in New Orleans. I sure hope so – if the reaction to the flooding in New Orleans would be standard procedure all over the US, that would be a very sorry state of affairs. My point is that in Thailand reactions like in New Orleans simply would never happen. I know, Thailand is not perfect, there are problems here like in any other country. I am just pointing out some positive features of Thailand. Ahah so good and so true. I’m a passionate traveller and can recognize so many situations I was in! Hihi making me laugh. I love Thailand too. Keep on writting, very nice! Agree with a couple of other posters regarding your comparison to the US on this one. 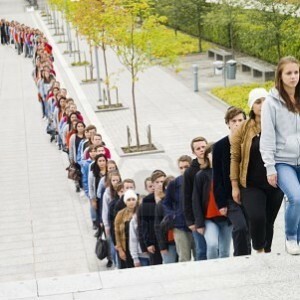 Been to several states in the US, and lived there for quite awhile – in most instances, lines were orderly and people generally patient..actually I can probably count the number of times on one finger where someone actually jumped queue, and was put straight pronto. Again,a place like nebraska or wyoming ain’t exactly the big apple. Now, India on the other hand is a different story. You’d be lucky to come out alive if your local saree store had a sale. Also, need to agree with the poster about 7-11 in thailand, it seems that in most places, whether Bangkok, Phuket, Hatyai, Udon Thani or Samui, queuing seems to be unheard of. Maybe Chiengmai is a different story. the queuing problem is not limited to just thais though. Try paying for something at the 7-11 at the mouth of soi nana in bangkok at 2am when all dem farangs are trying to buy condoms for use with their ‘thiraks’. Nuff said. or should i say…’muff said’…. It looks like I made a good choice by living in Chiang Mai. Here people seem to be more patient. I rarely see anyone pushing or cutting in the line, and that includes the 7-11 stores. Maybe that’s why Chiang Mai is exploding in popularity and size (This clearly has pros and cons as you can imagine). People here are generally very friendly and patient and easy going. I am well aware of the fact that Bangkok does not have the sweet laid back atmosphere of Chiang Mai, which is why I hardly ever go there. But then again I am just not a fan of any huge city. Most of my experiences of Thailand are based on living up north. We don’t have the excesses here that you can find in Bangkok, Pattaya or even Hat Yai. I guess Chiang Mai is quite different. I have lived in Bangkok,Northeastern Thailand and Chiang Rai. My experience at stores, vendors or other shops is that Thais very often cut in line with no concern for others. There isn’t necessarily pushing and poking, just squeezing in and putting products they want to buy right in front of you on the counter. The great majority of foreigners I interact with have the same experiences; on the road and in line, Thais can be very selfish. I have heard that from several people. I suspect that Chiang Mai is just a little different from other parts of Thailand since I practically never experience this here. Since I live in Chiang Mai, my observations stem mostly from what I see here. I guess there are regional differences.